Cook the rice according to the package directions. Heat 1 tablespoon of the oil in a large skillet over medium heat. Add the pineapple and cook, turning occasionally, until golden, 12 to 14 minutes; remove. Add the remaining 2 tablespoons of oil to the skillet. Rub the chicken with the jerk seasoning and cook in 2 batches until cooked through, 2 to 4 minutes per side. 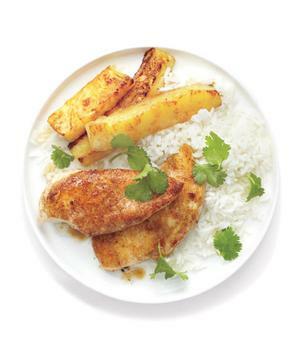 Serve the chicken with the rice and pineapple. Sprinkle with the cilantro.